The point of departure of this piece was an improvisation recorded two years earlier with Justin Yang and Grace Leslie. Although the piece ended up developing its very own compositional processes, mainly in terms of algorithmic manipulation of rhythm, the model offered by the recorded improvisation was always present to suggest important musical solutions throughout the compositional process. Soprano saxophone, prepared piano and live electronics. [ca. 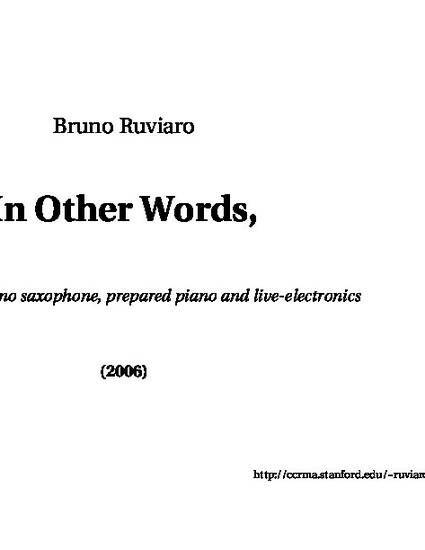 9′] Premiered by Eliot Gattegno (sax) and Chryssie Nanou (piano) at Stanford University on November 2, 2006. This work is licensed under a Creative Commons Attribution-NonCommercial-ShareAlike 3.0 Unported License.